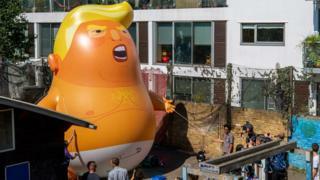 There has been much discussion about whether protesters should be allowed to fly an inflatable depicting Donald Trump as a baby, over Parliament Square. Some people say it is a legitimate protest against a US president with controversial policies, while others argue it is disrespectful to a democratically-elected ally of the UK with whom the government hopes to agree a free-trade deal. Last week, London Mayor Sadiq Khan gave permission for the helium-filled six-metre (19.7ft) high balloon to fly, tethered in Parliament Square Gardens. The group needed permission from the mayor because Parliament Square Gardens is controlled by the Greater London Authority (GLA). You need permission to do a whole range of things there, including holding a public gathering or standing on your own with a placard. Applications are considered by the city operations team at the GLA. Applicants have to show that they have sufficient insurance and there has to be a full risk assessment. The GLA told Reality Check that it's not its role to act as a censor, or decide what is or isn't a good protest. But it says it does work with the Metropolitan Police to reject anything containing illegal content, such as anything racist or homophobic. The Civil Aviation Authority (CAA) does not need to give its permission because the inflatable would be flying below 60 metres. But a CAA spokesperson said: "Anyone flying a tethered balloon below 60m may however still require permission from air traffic control if operated within 'controlled airspace', such as over Central London." The air traffic control provider NATS confirmed that the balloon would count as a non-standard flight in controlled airspace. Various parts of the country such as the area around airports and the centre of London count as controlled airspace and permission is required if you want to do things like release balloons or lanterns, tether a balloon or fly a drone. NATS ruled on Wednesday that the blimp would have no impact on normal air traffic operations. It told Reality Check that it receives many applications to tether balloons or tow banners behind light aircraft over London every year, most of which attract almost no attention from the public. It stressed that the shape of the balloon or content of the banner was not its responsibility.